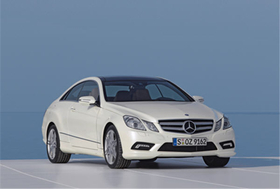 The E-class coupe shares most of its equipment and powertrain packages with its sedan sibling. Mercedes-Benz will give a world debut to its E-class coupe at the Geneva auto show in March. The coupe shares most of its equipment and powertrain packages with the new-generation E-class sedan that was unveiled on the sidelines of the Detroit auto show in January. For this reason, Mercedes has decided to price the coupe at the same level as the sedan. Mercedes said it will announce E-class sedan and coupe prices at Geneva. The E-class sedan will go on sale this month, followed by the coupe in June. In 2010, the sedan also will be offered with an extended wheelbase in China. That car will be produced there. In September, at the IAA in Frankfurt, Mercedes will present both the E-class station wagon and cabriolet. Sales of the station wagon will start after the show while the convertible will reach dealers in November. The E class is the lead vehicle for Mercedes' modular powertrain strategy, which requires any four-cylinder Mercedes engine to work with any Mercedes car model, from the A class's transverse mount to the S class's longitudinal layout. A new range of smaller, fuel-efficient four-cylinder gasoline and diesel engines are part of the E class's engineering package. For all the latest Geneva auto show news, go to Automotive News Europe's Geneva Web site here.